The Dancing Monkey, Greek and proud proprietor of his own imagined community where potential mates live up on puffy white clouds, George Karelia and Sons Superior Lights cigarettes grow on lemon trees, and religion consists of decrying the loss of Smyrna, is the man behind "The Rock," my moniker for Cyprus. For several years, we worked together as minor cogs in a wheel, and one day, frustrated by his boring life in Cyprus and dreaming of The (today undeserving) Motherland, The Dancing Monkey pejoratively referred to our beautiful island as "The Rock." From that day on, we somehow metamorphosed into cynical and bitter baboons dancing to the undesired beat of an island drum—I'd leave rotting Ecuadorian bananas on his keyboard and bark out the mating call of horny orangutans while he ate his chickpea and spinach stew for lunch, he would call me unflattering names such as "chimpo" and "Matyl, the macaque," while mocking my annoying (to him) dutifulness. For some reason, we kept in touch after I abandoned him to begin this mega-blockbuster-of-a-blog and pass on my limited knowledge of sociology, anthropology and philosophy (gasp!) to a bunch of mostly male immigrants like myself. Every so often, we'd go out for coffee or wine up at Plato's or dance uncontrollably—like Ian Curtis before he hung himself—at three a.m. at a random club somewhere in Nicosia. While puffing away into the night, he'd share his latest encounter with flighty women and his utopian dream of weaponizing a group of Greek rough riders to take back their land from the Turks, a plan certainly bound for failure given his morale-boosting idea of granting his troops a lengthy morning and afternoon coffee-break and monthly leave to recover from the tolls of war by rolling around like satiated walruses on a remote beach leading into the Myrtoan Sea. 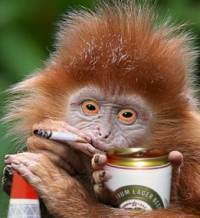 I kept telling The Dancing Monkey that it's time to introduce him to the blogging world as one of my antagonists. He initially refused, citing his position as a highbrow well-versed in nationalist theory as being incompatible with simian-themed mockery from a third-rate blogger. After at least a dozen attempts and a hefty contribution to his bundle of modern Mycenaean mercenaries, we landed at Academy 32 with The Godmother, My Zolpidem Supplier and The Wife, Ph.D., to clink our wine glasses and listen to Austria's jam band, Smart Love Junkies, rip through its eclectic repertoire. And just like that, for a few hours one cool autumn evening, The Dancing Monkey and I stopped flinging feces at each other and behaved like obedient and loveable circus pets. 2010 Tsalapatis Melapsopodi Sauvignon Blanc - Pineapple, mango and tropical aromas abound. Honeycomb, grapefruit, lemon zest and a bitter finish. Good length. However, it drank better the first time I tried it with R.O.I. and The Duke of Ducati. 86/100. 2008 Tsiakkas Bambakada (Maratheftiko) - Violets and dust on what is a tight nose. Red fruit, sour cherries and vanilla on the finish. Moderate flavors and medium bodied. 86/100.